Ok so it's no secret that I love makeup and I love many (many) makeup brands. One of the first high end brands I ever tried was Urban Decay so they hold a very special place in my heart. I remember the time when they had a big huge stand in BT2. Ahhh such joy. I still have very fond memories of the lip junk. Anyway Urban Decay are a really innovative brand, they like to push the boundaries with colours and names and their products are really fun and more importantly they are quality products. Their eyeshadows are brilliant quality and have really intense pigments. More than that they always produce the most amazing shades. 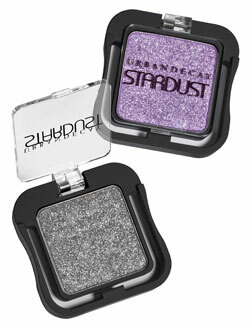 Stardust eyeshadows are Urban Decay's new collection of shadows. Urban Decay say that these eyeshadows have 40% more glitter than their other shadows. Now this can be a problem for some people cause I know some of the more glittery Urban Decay shadows have a great deal of glittery fallout. 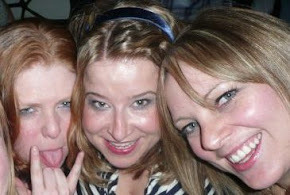 (I quite like a bit of glittery fall out on my cheeks but that is just me). Urban Decay also say that these shadows sparkle and glisten. Stardust shadows are of the same quality as other Urban Decay eyeshadows. They have a great function where you squeeze either side of the package and the lid flips open. How brilliant is that??? I love these shadows they do seem to glisten and gleam rather than have big chunky fall out. I bought the colours Diamond Dog (brown/taupe) and Atmosphere (deep turquoise) and I am loving them. My eyelids do shimmer. There are no big chunky bits of glitter. These eyeshadows can also be applied wet for a more intense colour. I did find that when you applied them wet there was a bigger chance of fallout. These colours can be used subtly or can be livened up for a more vibrant colour. Product: LOVE LOVE IT, i think these are a really nice shadow, I love Diamond Dog its just the right colour that you can use every day or vamp it up. You don't look like a glitter ball. Price: This makes me sad..... I bought these shadows up the north where they were priced at £13.50, in the USA they are $20.00 and in Ireland €19.00 yes feckin' euro which translates at approx $26.00. I would buy the rest of the collection no problem but I cant really spend €19.00 on each eyeshadow (ahem in this current economic climate ahem). I fear it is another case of rip off Ireland. If you can get your grubby mitts on one of these please give them a go and let me know what you think of them.